Weight: 900 lbs.Weight: 900 lbs. All hydraulic means no belts, gears, or chains. The hydraulic chain drive motor is attached directly to the head shaft. Maintenance is easy and repairs are minimized. A lower center of gravity provides stability. 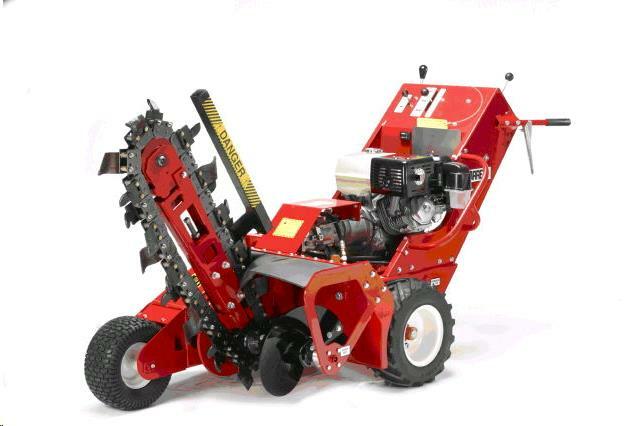 The outboard bearing is designed to protect the auger shaft from the bending that is sometimes caused by the impact of rocks or other debris when trenching. The control panel is simple and understandable. The safety clutch engages and disengages the wheel and chain drives. When the clutch is released, the engine continues to run and the controls remain in place, ready for you to resume trenching at any time. Variable speed drive allows the operator to adjust their wheel speed to the soil conditions. The reversible chain drive can be operated manually to dislodge obstructions or debris. The operator can manually unlock the axle with a lever on the control panel for easier turning when transporting. * Please call us for any questions on our barreto trencher 6 inch x30 inch rentals in Santa Ana and Orange CA.